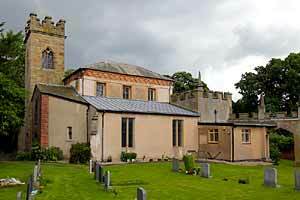 As might be suggested by the Norman piscina, a church in Tollerton is mentioned in Domesday Book. ‘It is the oddest building: the tower is stone, the body of the building stucco, the clerestory brick - all in a homely early 19th century Gothick style.’ So wrote Henry Thorold in ‘Nottinghamshire’. But the foundations were laid at the end of the 12th century. There is a chancel, a nave with a flat roof, side aisles with arcades of three bays, embattled north west tower with eight pinnacles (with vanes in the shape of keys) and three bells. It is connected to the adjacent hall by a cloister. The church was largely rebuilt in the early 19th century except for the chancel which was done in 1842. The arcades are still recognisably 13th century, though rebuilt in 1908; the tower has odd Gothic windows, ‘highly incorrect’ according to Pevsner. In the gallery above the west entrance is the squire’s pew with fireplace; next to it is the organ console. There is a fine stained glass east window which commemorates Mrs Susannah Davies who bought the property after the Pendock Barry family, for whom there are seven hatchments plus one for Mrs Davies. There are two fonts, one medieval tub shape, the other modern Gothic interlace; also a rare Norman pillar piscina. Most interesting is the mausoleum to Pendock Barry’s wife Susannah (d1811) separated from the south aisle by an elaborate wrought-iron gate. Inside is a glass ceiling on three semi-circular arches. A great memorial fills the east wall; smaller obelisk memorials in north and south niches bear unusual inscriptions.